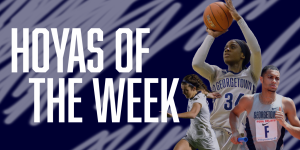 Welcome to ‘Hoyas of the Week,’ where we take a look at some outstanding performances in the past week across all of Georgetown’s athletic programs. This weekend, the baseball team went to Villanova and took two out of three from the hosts. After the Hoyas and Wildcats traded the first two games, senior right-hander Jack Cushing took the bump in the final matchup and did not disappoint. In a complete game victory, Cushing allowed just two earned runs on five hits and struck out six Wildcats. With his masterful performance, he lowered his season ERA to an impressive 2.61. 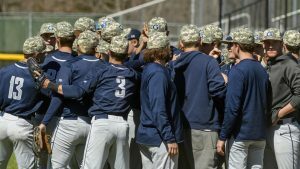 Baseball tries to keep the ball rolling with a game against Navy on Tuesday and a weekend series with Rider. The softball team went 2-1 this week and freshman right-handed pitcher Cassie Henning was a big reason why. On Saturday, Henning pitched both games in the doubleheader with Butler and allowed two earned runs over 14 innings as the Hoyas swept the day. Miraculously, Henning didn’t register a single strikeout on the day, which serves as a testament to her ability to pitch to contact. The Atlanta native also issued just two walks. Henning and her teammates host Villanova this weekend in a three game series. This week, the No. 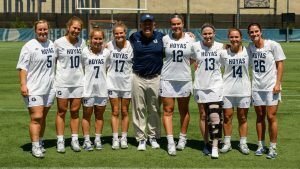 23 women’s lacrosse team took a loss to Navy on Wednesday but rebounded to down Villanova on Saturday. Senior attacker Morgan Ryan scored six goals and notched an assist, while only committing two turnovers. On Wednesday, Ryan was perfect on her only shot of the day, besting the Navy goaltender. Saturday, however, Ryan was all over the field. On eight shots, she beat the Wildcats’ defense five times and also notched four draw controls, good for second on the team. Ryan has now scored 33 goals, most on Georgetown, in 2019. Women’s lacrosse gears up now to take on No. 2 Maryland at 7:00 p.m. ET at Cooper Field on Wednesday. On Saturday, the men’s track and field team competed in the George Mason Spring Invitational, hosted by George Mason. As has become routine, fifth year student Joe White and senior Spencer Brown, both All-Americans, dominated. White won his 400-meter race, finishing with a time of 47.60, within a second of his personal best of 47.07. Meanwhile, Brown took the 800-meter race with a time of 1:49.12. The team will compete next in the Bryan Clay Invitational on Thursday in Azusa, CA. 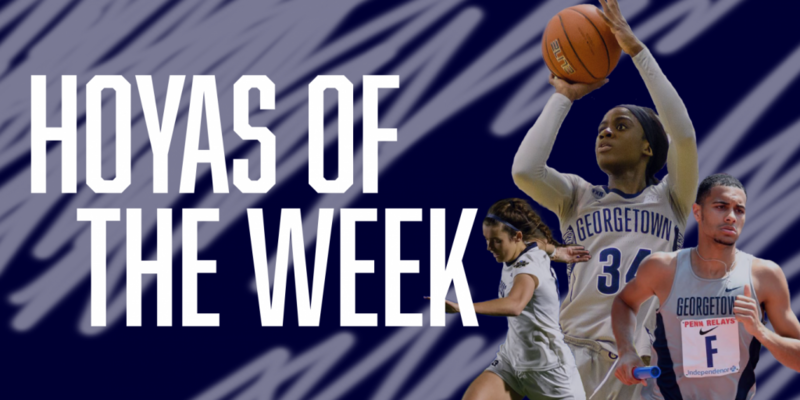 For continuing coverage of all Georgetown sports, follow @GUVoiceSports on Twitter.